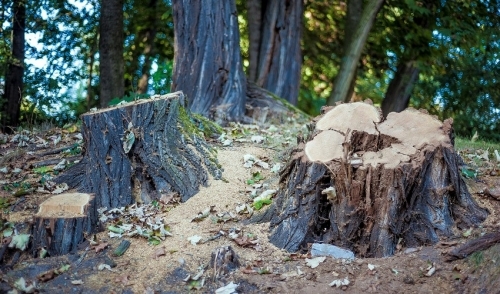 Before you plan on removing the stump, it’s probably a good idea to have the tools required to accomplish the task. Before you start going for the stump, make sure that you cut down all the branches with a hacksaw. Your two primary tools after that will be a spade shovel and a landscaping utility bar – basically a long solid steel bar that you will use for leverage to remove the stump. The first step to getting started is digging a trench all the way around the stump to the point where you can pretty much see most of the roots. Do not dig too close to the stump because the closer you get, the bigger the root will be. This will just create extra work for yourself that isn’t necessary. Now that you’ve dug your trench and a lot of the roots are visible, it’s time to get to work with the utility bar. You’ll want to lift the bar up and use its downward momentum to break up the smaller roots that you see. Continue doing this around the circumference of the stump. The end goal while doing this is to try to get the bar closer and closer to the center of the stump and pry up using the leverage of the trench you dug. If you keep using the utility bar effectively around the stump, eventually it will come up and you will be able to fill in the hole again.